RobbieB, Lady1911 and Odaon like this. 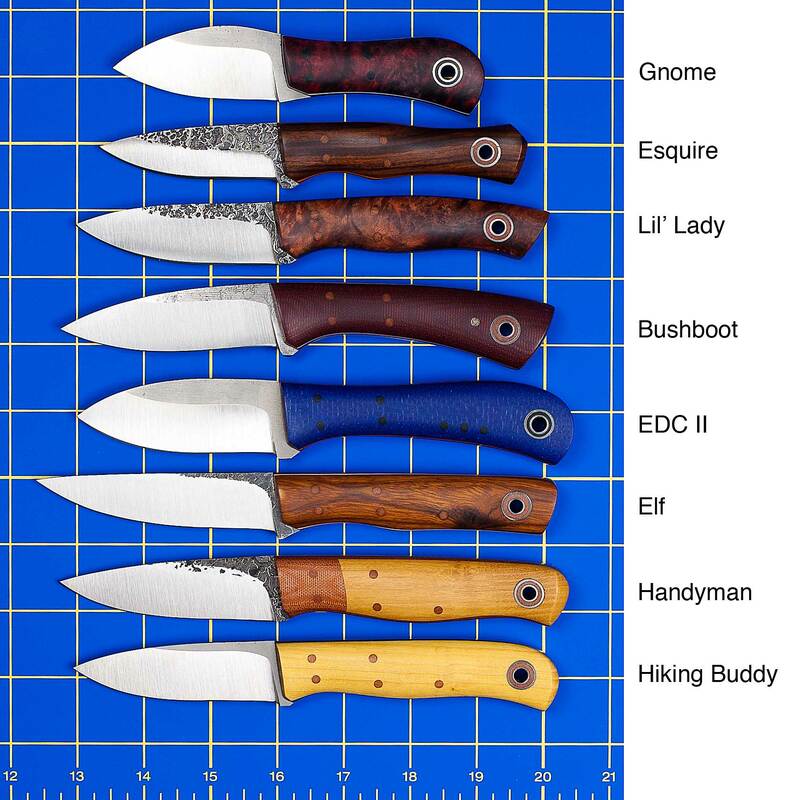 At the request of @Lady1911, here's a comparison of some EDC-size models with blade lengths ranging from 2.5 to 3.5 inches. These are aligned at the plunge line so you can see differences in blade length as well as handle length. newyork, Apocryphiliac, Bmurray and 7 others like this. A few more large models against the BSP for @lmalterna. Top down: Forager, Woodsman, Big Sneaky Pete, Duke, and Hiking Buddy for perspective. Apocryphiliac, jaz322, Bmurray and 3 others like this. Hmmm I guess this works here. The Loner and Hiking Buddy. The loner is becoming one of my favorite EDC knives due to its smaller size and flatter profile. Hiking buddy on left 1/8” Loner on right 3/32” not fully apples to apples. The HB is rounder and the Loner is taller, both fill up the hand width wise about the same. TPVT, varga49, Choppaman and 4 others like this. nice ones. when you can, any chance you can post a spine shot? 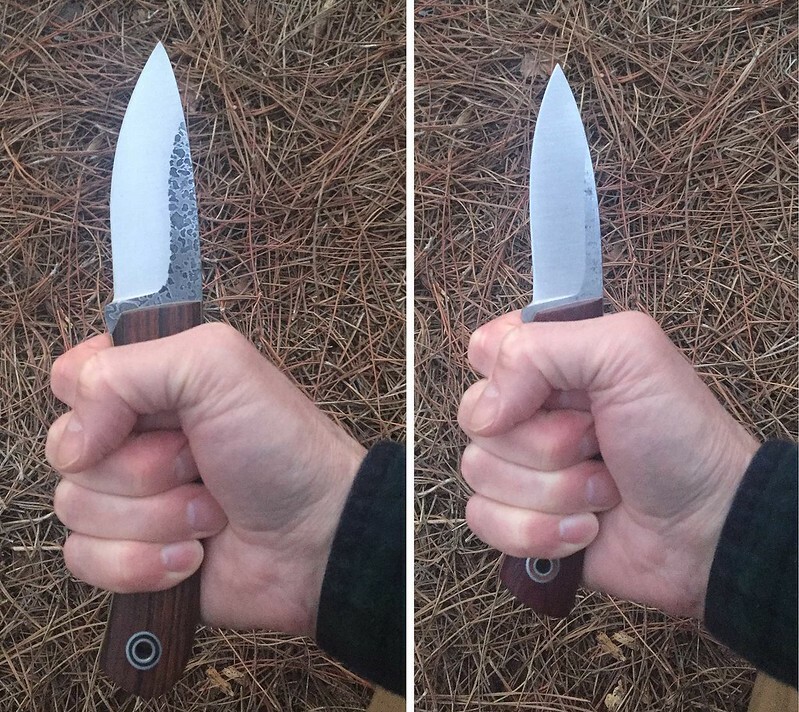 looking to see the difference in handle contours and thickness. thanks. 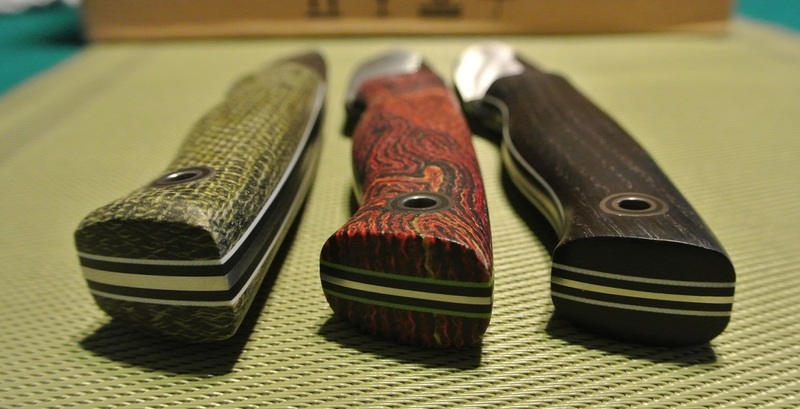 those are handsome knives. Within a given Fiddleback model, the thickness can vary quite a bit from super slim to "broomstick" (not meaning that in a negative way) depending on what Andy is feeling each one should be as he makes them. So you can't really compare handle thicknesses from model to model. I'm not discouraging spine / contour pics per your request but you'll need to take the comparisons with the variation into consideration. Comprehensivist, Lady1911, TPVT and 4 others like this. @TPVT, what @Warrior108 said. The spine thickness that is important is the spine thickness of exact knife you are thinking about purchasing. @David L @Warrior108 ... yup, understood/agreed. though, i would expect the contours to stay relatively the same and just the thicknesses to change (e.g. barrel, coke bottle, “regular palm swell contour”, etc). just wanted to get a look. i wasn’t familiar with the loner and was feeling lazy. thanks guys. i appreciate the extra pics and feedback. @David L @Warrior108 ... yup, understood. though, i would expect the contours to stay relatively the same and just the thicknesses to change (e.g. barrel, coke bottle, “regular palm swell contour”, etc). just wanted to get a look. i wasn’t familiar with the loner and was feeling lazy. My favorite of the 3 Bushingers is the middle / reddish one. Just because it might not be obvious from the pics, the concave parts go more narrow than the bog oak one and the front and back ends flare a bit more to help with keeping a better grasp and not slipping. Holding the reddish one my hand says "Ohhh!" 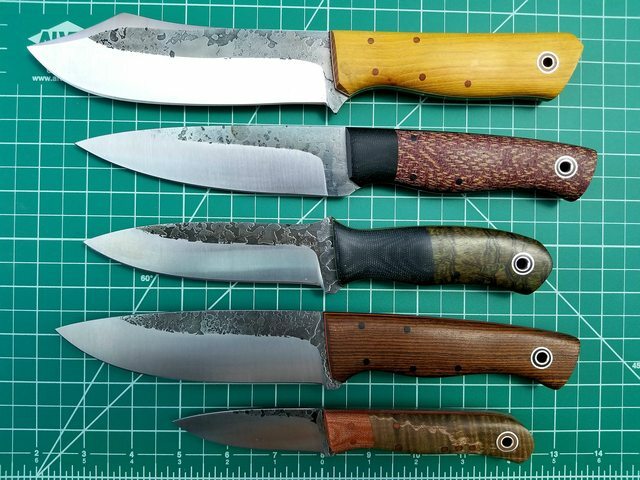 and sadly when I pick up the bog oak one (probably my favorite material) my hand says "Meh" If you look at the last picture, you'd never guess that the evergreen burlap one has the thinnest (3/32") blade stock of the 3 knives. I ended up returning the green one to the dealer just because it was pretty far from my personal/individual preference. right on. and i like how you put it. my hand has to like the handle before any knife gets used. a knife might be beautiful and the steel made of “diamonds”, but it won’t matter if it’s not comfortable in-hand. and therein lies the rub. 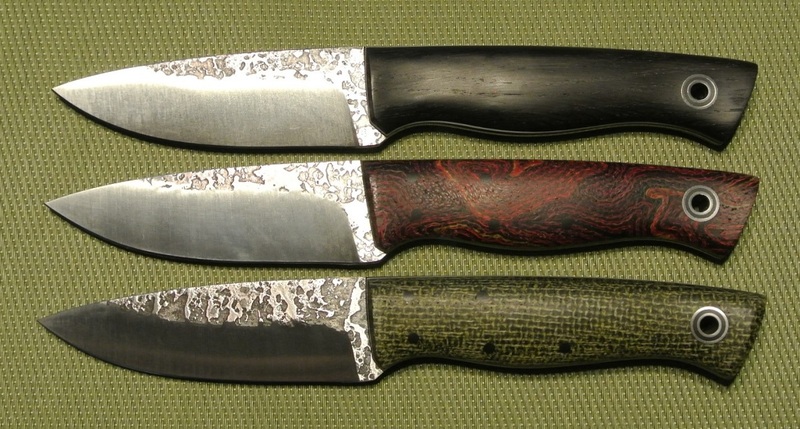 i don’t envy knife-makers, as every hand is different. but as a consumer, it’s half the fun (for me)...searching for that knife that’s a perfect fit.